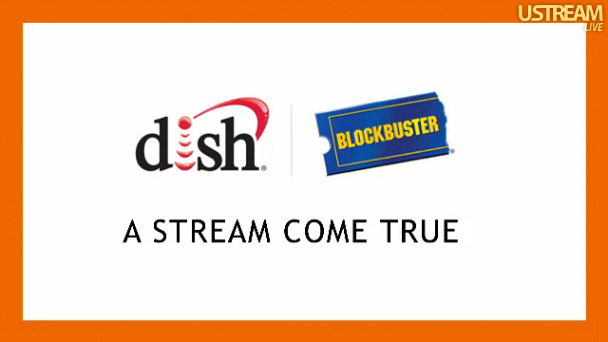 DISH Network just announced their new integrated DISH/Blockbuster service, now called "Blockbuster Movie Pass" and while it's a nice product integration for those that already have DISH's pay TV satellite service, the new offering is not available as a stand-alone subscription and poses no threat to Netflix. DISH advertised today's announcement as "A Stream Come True", but overall, the announcement was a complete disappointment. For those that already have DISH Network, the cost for the new service will be $10 a month and new subscribers to DISH's TV service will get the service for free for 12 months. DISH did say they want to bring movie services to non-DISH subscribers, but all the company would say is that they will share those details "in the future" with no ETA as to when that might be. 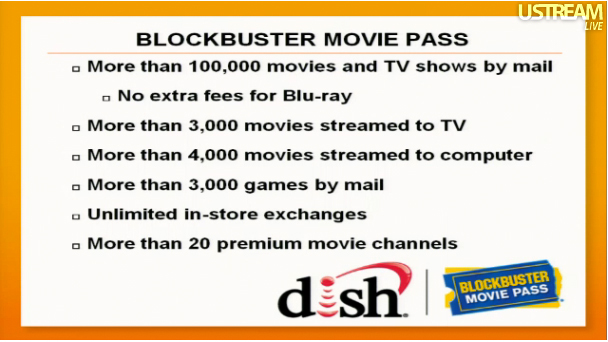 DISH said that with the new Blockbuster Movie Pass service, customers can get 5,000 movies and TV shows streaming to their TV and 10,000 movies and TV shows streaming to the computer. 3,000 of those titles for TV are from the Blockbuster side of the house as well as 4,000 titles for the computer. Those are not very impressive numbers. 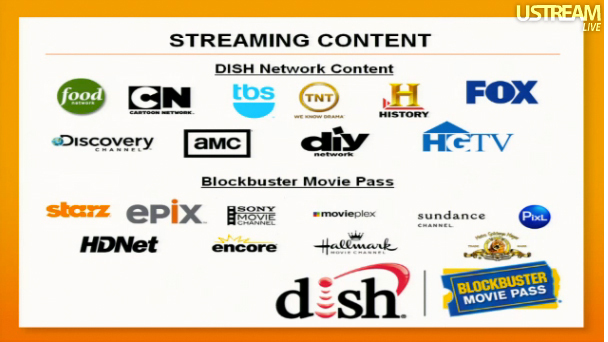 At a time when consumers are asking for more content delivered via streaming, DISH spent most of the time focusing on how you can get DVD's and games in the mail. The company showed off a bunch of new commercials for the service and in nearly ever one of them, they talked about how you can get 100,000 movies, TV shows and games "delivered straight to your door by mailman". One of the commercials even showed a mailman being all excited in the video. The problem is that the future of this business is not about consumers getting envelopes delivered by their mailman, but rather the ability for consumers to stream more movies and TV shows directly to devices. While executives from both DISH and Blockbuster spoke, I had to laugh when the President of Blockbuster took to the podium. 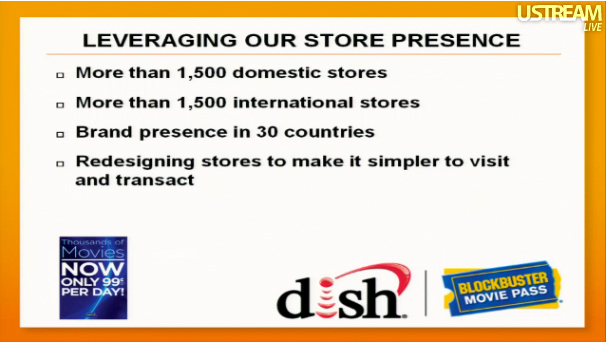 He gave an update on the Blockbuster integration with DISH and said that, "the hero of the Blockbuster brand has been the store itself". Really? Then why didn't Blockbuster survive in the market? 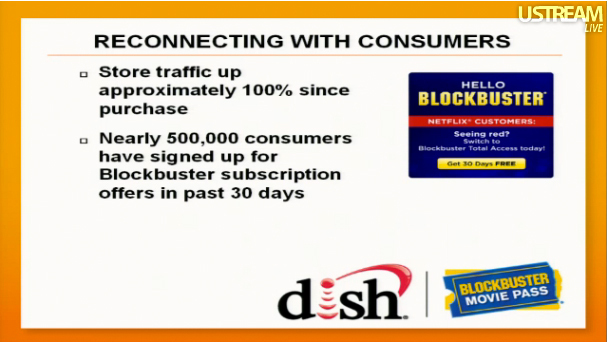 He also reinforced that since the DISH acquisition, Blockbuster has signed up 500,000 customers in last 30 days, yet that's a pretty meaningless number. He also said that "Blockbuster stands for new releases", but of course he is talking about for physical DVDs and not when it comes to online content as Blockbuster's new release inventory for streaming is very weak. 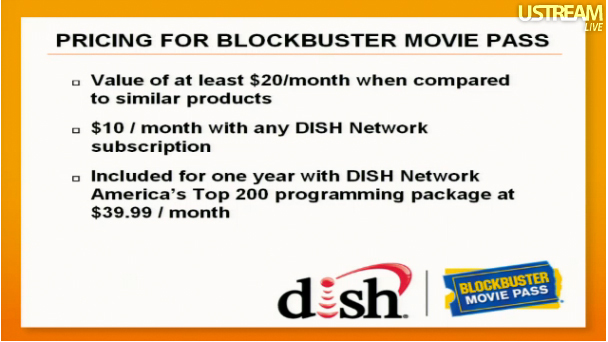 I really don't get why DISH thinks the Blockbuster name has any value left in the market, it doesn't. DISH did mention more than once about IP enabled set-top-boxes, as if they were also trying to show they know the importance of connected devices, yet they would not say exactly how many of their boxes are actually connected to the Internet when asked during the Q&A portion of the event. 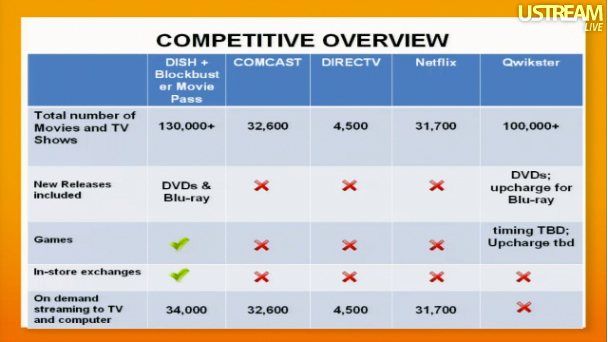 The CEO of DISH did say that they have 5-6M IP enabled boxes in the market, but that number is meaningless. If 50% of their set-top-boxes are connected, it means that even Roku has more connected boxes in the market than DISH does. While advertised as a bigger deal, today's announcement by DISH is really only relevant to those who already have their service, or are looking for a new pay TV provider. And for anyone who does not have line of sight, does not have permission to install a dish receiver on their roof, or wants one provider for phone, Internet and TV, DISH is not an option. Until DISH announces some kind of streaming only service, they pose no threat to Netflix, Hulu, Amazon or any other subscription based service. 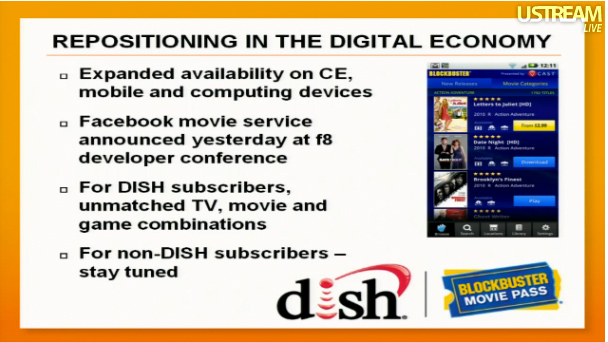 I've included some slides from the DISH presentation below.